Drupal, one of the web’s most popular open source content management systems, just celebrated their 13th anniversary with a flourish. The company is gearing up for its next major release, D8, and the timing couldn’t be better to start taking advantage of Drupal’s growing e-commerce potential now by integrating an Ecwid shopping cart into your Drupal site. Let’s take a look at how you can easily integrate Ecwid with Drupal. The new version of Drupal is expected to make Drupal-based sites less complex and easier for non-Drupal experts to maintain. All of this is good news for those looking to add an online store to their Drupal page, especially since integrating Ecwid into a Drupal site is already so seamless and user-friendly. Once you’ve taken a moment to create an account with Ecwid, adding the free and feature-rich Drupal e-commerce module is a breeze. Just install the module from Drupal, which will create a new Store page on your site. Then log in to your Ecwid control panel, obtain your Store ID and add it to the settings page of the installed Module, and your store is ready to go. Your Ecwid store will be smoothly integrated into your site, and will also look great on mobile devices. Then comes the fun part: customization. You can integrate Ecwid into your Drupal store in a variety of ways, including setting up a minicart for easy customer check-out, vertical categories to display your products, and a search block to make exploring your inventory a breeze for your visitors. You can also customize how you want billing and shipping handled for your customers’ orders. 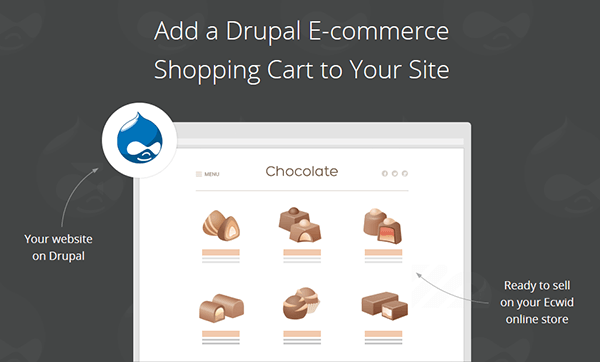 And in keeping with the spirit of Drupal’s open source programming, Ecwid invites you to submit suggestions and ideas for how to better improve the operation of your Drupal shopping cart. So, with the release of Drupal 8 just around the corner, now is the time to get started with your Ecwid shopping cart. Installation and management couldn’t be easier, and you’ll watch your business grow while taking advantage of Drupal’s new features when they’re released.